Friday, May 2, 1913: My thoughts this evening are hardly worth writing about. Grandma—There must have been something worth writing a hundred years ago today. Did you ever try the menus that were published in Good Housekeeping magazine? 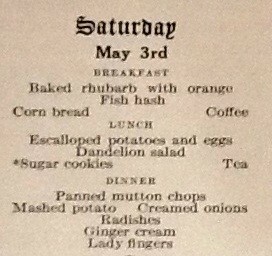 One of the foods listed on the May 3, 1913 menu is Baked Rhubarb with Orange. .
Preheat oven to 375°. In a small bowl combine the sugar, mace, cloves, and cinnamon. Set aside. Wash the oranges, and pare off the peel thinly; coarsely chop and then set aside. Remove white inner skin and seeds from oranges and halve. Cut halved oranges into 1-inch pieces. 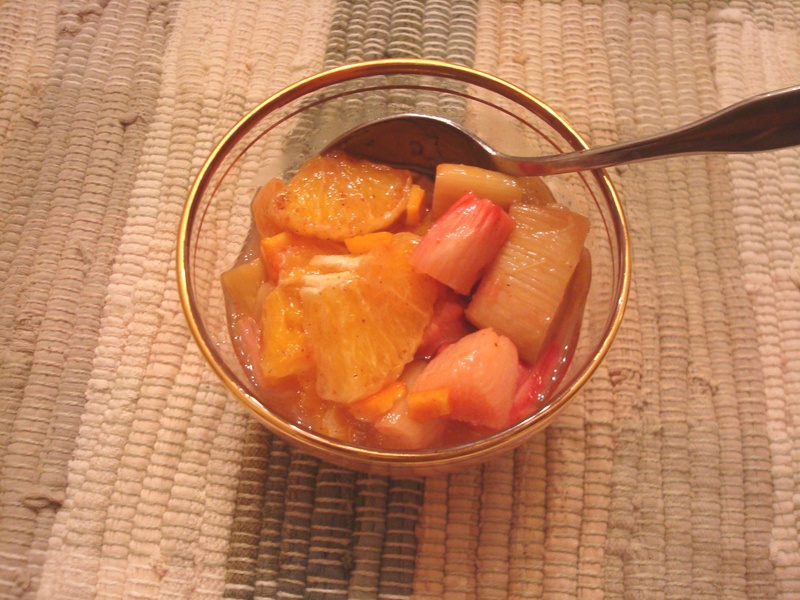 In a large bowl combine the rhubarb, orange pieces, chopped orange peel, and sugar mixture. Put into a 2-quart baking dish. Bake in oven for approximately 45 minutes, or until the mixture is hot and bubbly—and the rhubarb is tender. This dish is excellent. The orange peel and spices nicely balance the tartness of the rhubarb. Rhubarb thus prepared keeps well, and is good morning, noon, and night. As a breakfast relish, nothing is finer than a very tiny saucer of it. Posted on May 3, 2013 August 30, 2015 by SherylPosted in Food, recipesTagged desserts, rhubarb. Thanks for the recipe, it sounds very refreshing. I really liked the recipe. Refreshing is the perfect word to describe this recipe. The spices and orange peel give the rhubarb a really nice, lively flavor. It is very different from what you’d see today! It’s really focused on seasonally available foods–including early spring produce (rhubarb, radishes, dandelion) and vegetables that might have been stored over the winter months (potatoes, onions). Looks like a really good way to enjoy rhubarb! I never thought to mix rhubarb with orange. Great idea. I also never thought of adding oranges–today we tend to instead use strawberries– to rhubarb, but the two fruits work well together. My dad’s birthday was mid-April, and rhubarb pie was his “birthday cake” every year, for that’s when the rhubarb was ready to eat. We never had it with oranges or any other fruit, but I’m sure there was a lot of sugar in the recipe! What great resources you have found for menus and life at that time. mmm–Rhubarb pie is one of my favorite pies. I’ve learned that rhubarb is one of the rare foods that doesn’t care if you use artificial sweetner when cooking. It’s easy to adjust to taste. I learned something new. Until I read your comment I hadn’t known that rhubarb works particularly well with artificial sweetners. I’ll have to try it. The luncheon menu sounds just right to me. I love any kind of potatoes. This dish sounds a little like something that would make a good brunch, too. Somehow I think I’d find fish hash more approachable in the afternoon. I enjoyed this look into the meals of long ago. Old menus are so much fun. 🙂 I can’t quite imagine what fish hash would taste like. I think that you’ll like it. My husband asked me today when I was doing to make it again. I’ve GOT to try these recipes sometime!